There are very few flavors I love more than ginger. In fact, I can't think of any right now. Ground ginger. Crystallized ginger. Fresh ginger in savories and sweets. Ginger tea. Here are some ginger scones from a Williams-Sonoma's recipe that is an adaptation from the Zuni Cafe in San Francisco. Whoo hoo! It's National Library Week. I love this quote from Eleanor Crumblehulme. You can get a t-shirt of it too! (Designed by Daniel Solis). 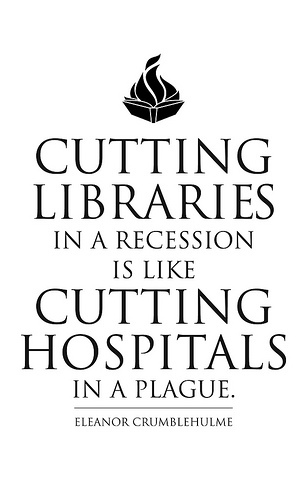 I hope you are visiting your local library and checking it out (oh yes, we librarians are full of puns). I love all your sweet comments about the importance of libraries in your life and community! Next time, I could have made these a bit thicker, but they were tasty. I also brushed on some cream and sanding sugar. Sanding sugar is happiness in little crystals. Put it on everything. Except maybe steak. This is supposed to make 8 scones, but I cut them with these cute biscuit cutters (smooth side) and got a bunch. And guess what? You can win a set of these cutters for National Library Week!! Enter until April 16, 2012! The Williams-Sonoma recipe uses a scone pan and food processor. I made mine by hand and cut them with biscuit cutters. 1. Preheat an oven to 350ºF. 2. In a large bowl, whisk together the flour, sugar, baking powder and salt. 3. Add the butter and using a pastry cutter or your fingers, combine until it resembles pea-size crumbs. 4. Add crystallized ginger and stir to mix. 5. In a small bowl, whisk together the egg and cream until blended and add to the flour mixture. Using a fork, stir to form large, moist clumps of dough. 6. Turn the dough out onto a lightly floured surface and press with your hands until the dough comes together. Roll out the dough, 3/4 inch thick. Cut into shapes and place on parchment lined pan. 7. Bake until the scones are golden, about 25 minutes. 8. Place scones on wire rack and let cool. Enjoy! I love making scones. They are perfect with a hot cup of tea. Great giveaway. Another fun giveaway! I love scones and can't wait to try this recipe. Wow I never made scones before! If I won these biscuit cutters, then that would give me an opportunity to make some.